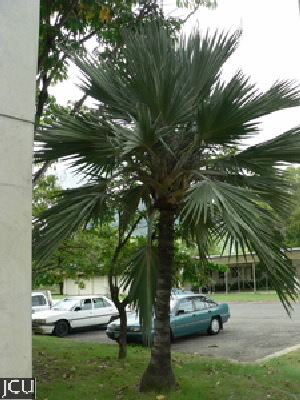 A solitary, fan-leafed palm from the Mascarene Islands. This palm is distinguished by the bright red petioles and streaks of red in the old leaves. The trunk is grey. Plants are either male or female. Fruits subglobose to 4.5 x 4 cm, black at maturity with three seeds.